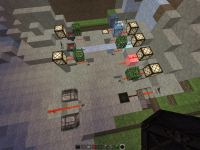 Redstone wire in some situations uses different logic for connecting visually (in which direction the dust texture goes) and logically (what gets powered). Glowstone should possibly not show redstone wire on its side since all other blocks which only transfer a redstone signal upwards have no wire on their side. MC-108512 Redstone line going up a slab acts as a dot, powering mechanism components next to it, even though it appears to not be pointed at them.